GlobeCore Takes Part in AWEA Wind Power Conference and Exhibition - ! Equipment for Transformer Oil Reclamation. GlobeCore. 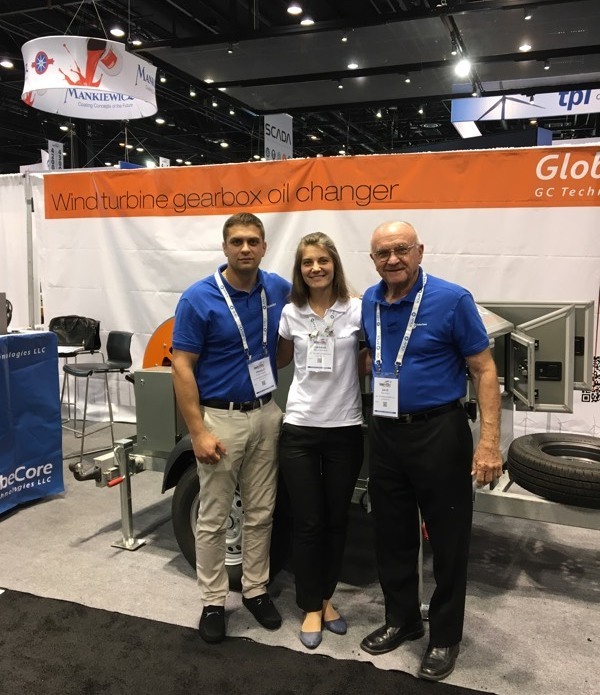 GlobeCore and GC Technologies participated in the AWEA Wind Power Conference and Exhibition in Chicago on 7 – 10 May. This is the largest event held under the aegis of the American Wind Energy Association (AWEA), which brings together the wind energy market professionals: manufacturers, suppliers, customers and anyone interested in ground-breaking innovations in this dynamic industry. In 2018, Approximately 7600 companies from over 50 countries participated in AWEA Wind Power Conference and Exhibition in 2018. GlobeCore had a separate exhibition stand, with a compact and mobile CMM-GL unit, designed for a three-stage process of changing oil in wind-turbine gearboxes (removal of old oil, cleaning of the gearbox and filling it with new oil). Visitors could learn about other GlobeCore products from brochures and catalogues, and could speak with our representatives. Beside the CMM-G and GL units, our company also manufactures equipment for purification of electrical insulation oil and evacuation of transformers at wind farms (the CMM-0.6, CMM-4/7 and other models). In general, GlobeCore had a very good experience participating in AWEA Wind Power Conference and Exhibition-2018. We were able to meet some of the main players in the wind energy market and learn a lot of things useful to perfect the currently available equipment and to develop new products.